On the Nature of Things (De Rerum Natura), the magnificent Epicurean poem by the Roman philosopher Lucretius, contains a number of passages in book V that speak to an evolved world. Lucretius was an atomist who believed in free will (the random swerves of atoms precluded a strictly mechanical or predestined world) and rejected the notion that there is a designer or creator of the universe. Lucretius was strongly antagonistic to organized religion, and argued that when the body dies, so too does the soul (there is no afterlife). A few examples of passages that describe a world constantly changing and evolving follow below. There is even what might be viewed as a rudimentary concept of natural selection, in which mutant forms of life, if maladapted, are eliminated (though this passage lacks the generative force of better adapted forms giving rise to new kinds). Although modern English translations abound, I have chosen the earliest English translation – by none other than John Evelyn, the diarist and author of the first book published by the Royal Society of London: Sylva or a Discourse on Forest-Trees, and the Propagation of Timber in His Majesty’s Dominions (1664). Who better to capture the meaning of trees and their rise to prominence? Also, the concern that translations post-1859 might inadvertently reflect the modern perspective of natural selection is thus obviated by choosing a translation from the 1650s (from Repetzki, M.M. 2000. 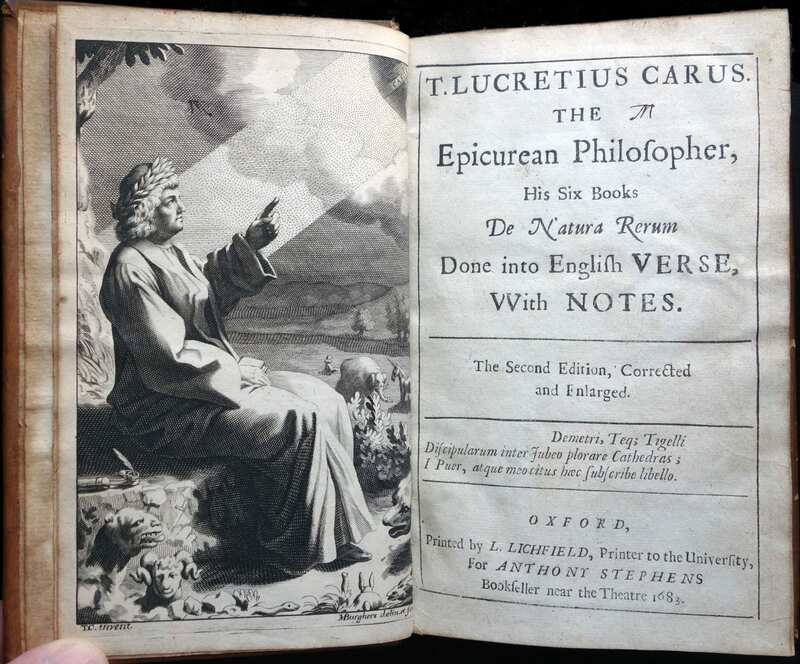 John Evelyn’s Translation of Titus Lucretius Carus De rerum natura). Another growes, & from contempt doth rise. And now dos what to doe it knew not how. Nor take things for their use, nor flie from harme. So that the femal with the male be joynd. Although the first translation of On the Nature of Things from Latin into English was by John Evelyn, he only published the first book of the six books that make up the poem. The remainder of his translation remained in manuscript until published in 2000. The first published full translation, by John Creech, appeared in 1682, with a second edition (pictured here) published a year later.